Reverse shoulder arthroplasty (RSA) shows a growing number of implantations and is a valuable option to improve shoulder function and decrease pain. However, there is no consensus concerning the rehabilitation protocol following surgery. 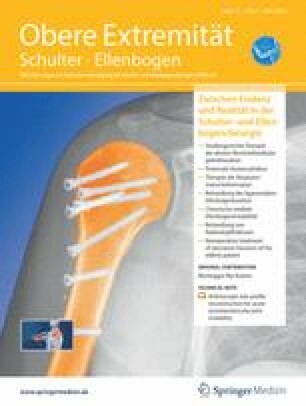 To review and evaluate current rehabilitation contents and protocols after RSA by reviewing the existing scientific literature and providing an overview of the clinical practice of selected German Society of Shoulder and Elbow Surgery (Deutsche Vereinigung für Schulter- und Ellenbogenchirurgie e. V., DVSE) shoulder experts. A literature search for the years 1989–2016 was conducted in relevant databases and bibliographies including the Guidelines International Network, National Guidelines, PubMed, Cochrane Central Register of Controlled Trials, Cochrane Database of Systematic Reviews and the Physiotherapy Evidence Database. In addition, 63 DVSE experts were contacted via an online questionnaire. Since no level I/II studies on postoperative protocols after RSA were found, the 856 hits were searched by the committee members and sorted according to the topics “rehabilitation”, “complications”, “clinical outcome studies”, “basic science”, “reviews” and “miscellaneous”. Additionally, survey results were analyzed and compared to the literature. The comparison between literature recommendation and expert survey showed agreement according principal aspects (e.g. brace/sling, immobilization, passive exercises). Based on the literature and the expert opinions obtained, a four-phase rehabilitation protocol could be developed. Eine Arbeit der Kommission Rehabilitation der Deutschen Vereinigung für Schulter- und Ellenbogenchirurgie (DVSE) e. V. in Zusammenarbeit mit dem Deutschen Verband für Physiotherapie (ZVK) e. V., dem Verband Physikalische Therapie – Vereinigung für die physiotherapeutischen Berufe (VPT) e. V. und der Sektion Rehabilitation – Physikalische Therapie der Deutschen Gesellschaft für Orthopädie und Unfallchirurgie (DGOU) e. V.
Bezüglich der inversen Schulterprothetik ist eine wachsende Anzahl von Implantationen zu verzeichnen. Sie ist eine wertvolle Option zur Verbesserung der Schulterfunktion und zur Schmerzlinderung. Das Rehabilitationsprotokoll nach der Operation ist jedoch noch wenig einheitlich. Überprüfung und Bewertung aktueller Rehabilitationsinhalte und -protokolle nach inverser Schulterprothetik durch Überprüfung der vorhandenen wissenschaftlichen Literatur und Bereitstellung eines Überblicks über die klinische Praxis ausgewählter Schulterexperten der Deutschen Vereinigung für Schulter- und Ellenbogenchirurgie e. V. (DVSE). Eine Literaturrecherche für die Jahre 1989 bis 2016 wurde in einschlägigen Datenbanken und Bibliographien durchgeführt, einschließlich von Guidelines International Network, National Guidelines, PubMed, Cochrane Central Register of Controlled Trials, Cochrane Database of Systematic Reviews und Physiotherapy Evidence Database. Darüber hinaus wurden 63 DVSE-Experten über einen Online-Fragebogen kontaktiert. Da keine Level-I/II-Studien zu postoperativen Protokollen nach inverser Schulterprothetik vorlagen, wurden die 856 Treffer von den Ausschussmitgliedern begutachtet und nach den Themen „Rehabilitation“, „Komplikationen“, „klinische Ergebnisse“, „Grundlagenforschung“, „Überblick“ und „Sonstiges“ eingeteilt und bewertet. Zusätzlich wurden die Umfrageergebnisse analysiert und mit der Literatur verglichen. Der Vergleich zwischen Literaturempfehlung und Expertenbefragung zeigte Übereinstimmung unter den Hauptaspekten (z. B. Bandage/Schlinge, Immobilisierung, passive Übungen). Basierend auf der Literatur und den Expertenmeinungen konnte ein Vierphasenrehabilitationsprotokoll entwickelt werden. Reverse shoulder arthroplasty (RSA) has become increasingly popular for the treatment of osteoarthritis (OA) in the case of rotator cuff insufficiency . Due to its positive results, the indications for RSA have been widened to younger and more active patients. This could be explained by superior knowledge of biomechanics, the improvement of implants, growing revision numbers in primary anatomical shoulder arthroplasty (TSA) and additional indications, e. g. fracture treatment in the elderly patient . Current studies have demonstrated a significant improvement in postoperative range of motion (ROM), activities of daily living (ADL) and strength. The current literature search followed a hierarchical structure (best available evidence) based on postoperative treatment guidelines, health technology assessments (HTA), systematic reviews and clinical studies that investigated postoperative protocols after RSA. The search of treatment guidelines was conducted in the databases of the “Guidelines International Network” (http://www.g-i-n.net/) and various other national guidelines: National Guideline Clearinghouse (NGC), German Association of Scientific Medical Societies (Arbeitsgemeinschaft der wissenschaftlichen medizinischen Fachgesellschaften, AWMF), Scottish Intercollegiate Guidelines Network (SIGN), National Institute for Health and Clinical Excellence (UK; NICE) and Health Technology Assessment (HTA), International Network of Agencies for Health Technology Assessment (INAHTA), Health Technology Assessment International (HTAi), European network for Health Technology Assessment (EUnetHTA), German Institute for Medical Documentation and Information (Deutsches Institut für Medizinische Dokumentation und Information, DIMDI), German Institute for Quality and Efficiency in Health Care (Institut für Qualität und Wirtschaflichkeit im Gesundheitswesen, IQWiG). 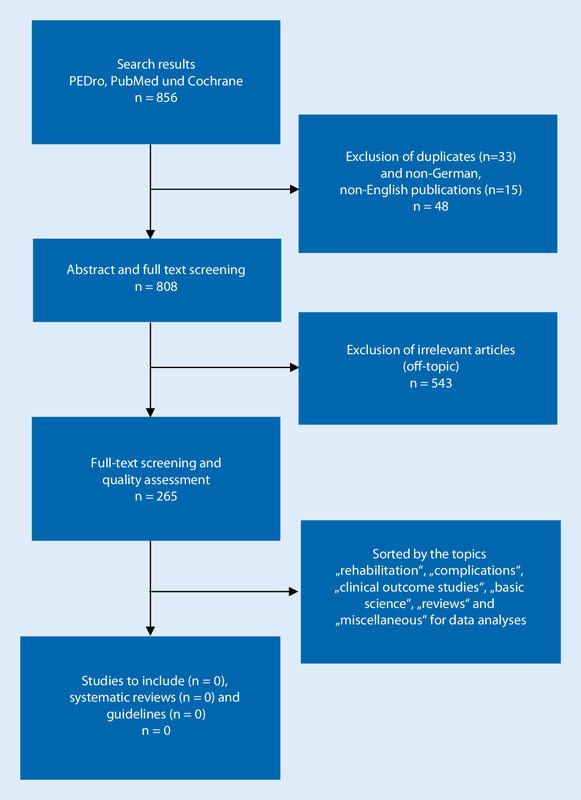 A search for meta-analyses, systematic reviews and primary studies was conducted using the electronic databases Medline via PubMed, the Cochrane Central Register of Controlled Trials, the Cochrane Database of Systematic Reviews and the Physiotherapy Evidence Database (PEDro) with the keywords “(reverse OR inverse) AND shoulder AND (arthroplasty OR replacement OR prosthesis)”. The period between 01/1989 and 01/2016 was the period of reference. In addition, a manual search was conducted that included general internet research, a screening of the literature references listed in the collected articles and a renewed assessment of various journals. A manual search for relevant basic science and biomechanical studies was also performed. The relevant publications were selected based on how relevant their content was to the issue, whether they were in English or German and whether the comparative studies enlisted at least 10 patients per group. The literature selection was planned to be based on the population, intervention, comparison and Outcomes (PICO) concept of the Cochrane Institute. The levels of evidence were interpreted based on the classifications of the Oxford Centre for Evidence-Based Medicine (OCEBM) 2009. In addition to the PICO concept, the further evaluation by the PEDro scale (www.pedro.org.au) was planned. Due to the lack of search results for level 1 and 2 studies comparing postoperative protocols after RSA and guidelines, the planned analysis could not be performed. Therefore, the 856 studies were searched by the commission members and sorted by the topics “rehabilitation”, “complications”, “clinical outcome studies”, “basic science”, “reviews” and “miscellaneous” (Fig. 1). The online tool Surveymonkey (www.surveymonkey.com) was used to survey 63 selected DVSE experts in RSA between 10/2017 and 12/2017. The experts were informed about the background of the survey via email. To increase the participation rate a friendly reminder was sent three times. The rate of participation was 63.5%. Since there are no actual guidelines regarding a rehabilitation protocol after RSA, the following paragraph summarizes the published protocols in clinical studies after RSA implantation. Boudreau et al. published a proposal for a rehabilitation program based on scientific considerations and clinical experience . No studies have been published on different treatment options and, despite a huge number of publications on RSA, the authors’ literature search found only 22 papers with a more or less clear description of the postoperative treatment protocol. An overview of the papers is shown in Table 1. RSA: does reduced medialisation improve radiological and clinical results? Immediately p.o. increasing to 2 weeks p.o. Do the indications, results and complications of RSA change with surgeon experience? The combination of physiotherapy and self-exercise was considered appropriate in the majority of cases in the expert survey (Table 2). The use of self/home exercises makes sense in the earlya post-operative phase after RSA. I hand out a post-operative exercise plan to the patient. The initial instruction of self/home exercises after RSA by a physiotherapist makes sense. The visualization of self/home exercises (by photo/video) makes sense. Self/home exercises supersede physiotherapy units after RSA. A majority of the survey participants fears stiffening when the shoulder is immobilized for 4–6 weeks after surgery. The results of dislocation prevention and deltoid strengthening show no trend (Table 3). I fear a relevant stiffening of the shoulder if it is completelya immobilized for the first 4–6 weeks after RSA. I limit active and passive ROM after RSA in the first 4–6 weeks since I fear dislocation of the implant. I allow strengthening exercises of the deltoid muscle from week 7 post-operatively. The data from the DVSE expert survey show that a majority of surgeons individualizes the treatment protocol for different indications. For example, individual treatment with and without subscapularis refixation was seen indifferently, with 29.7% participants changing their protocol for refixation and 32.4% not (Table 4). I define the start of active ROM individually according to pretensioning of the deltoid muscle and acromion morphology. I define the duration of immobilization depending on subscapularis refixation or not. I define the duration of immobilization differentiated between indications (e. g. fracture or cuff tear arthropathy). The postoperative protocols of fracture and CTA indications are compared in Table 5. In conclusion, no relevant difference is seen. Recommendation of orthopaedic brace or sling and if so, which one? Timeframe a brace/sling should be worn? The survey revealed strong support for the four-phase rehabilitation protocol with time- and criteria-based phase transitions (Table 6). The rehabilitation protocol after reverse shoulder arthroplasty should have a progressive exercise set-up and can be divided into four phases. The phase transitions and load increases should be time-based and criteria-based. The expectations of the patient and the general treatment expectations from the literature are essential in the planning of the rehabilitation process. Clinical studies show a significant reduction in pain and a gain in active anterior elevation and abduction of 50°–60° at 2–5 years. This reflects a postoperative relative age correlated constant score between 75%–80% depending on the indication [14, 51]. Nevertheless, the improvement of external rotation is postoperatively not significantly improved (a gain of around 5°–15° compared to preoperatively) and is significantly lower in comparison to anatomical TSA (53° vs. 38°) . Compared to anatomical total shoulder arthroplasty (TSA), the expectation of postoperative internal rotation is also significantly lower. Triplet et al. showed that 67% of TSA patients achieved T12, whereas in the RSA group only 32% were able to achieve T12. In the subgroup analyses of the RSA group, revision arthroplasties showed significantly decreased internal rotation . This aspect is especially important for managing toileting or washing of the back and needs to be considered in postoperative training and functional expectations. Besides range of motion, strength plays an important role in ADL. Wiater et al. showed that the preoperative deltoid size and fatty infiltration correlates with postoperative functional scores and strength . In terms of rehabilitation, this means that a reduction in postoperative deltoid atrophy could lead to improved function, but irreversible fatty infiltration of the deltoid may only allow functional improvement to a certain limit. Alta et al. compared isokinetic strength between TSA and RSA and revealed increased strength for TSA patients. In the RSA subgroup, weak external rotation torques correlated negatively with functional scores . Scapulothoracic setting and strength is essential in RSA. Therefore, the influence of scapulothoracic muscle function provides highly interesting insights into the varying shoulder function compared to an anatomic shoulder. The upper trapezius and deltoid show significantly increased electromyography (EMG) activation during elevation and abduction. This reflects the findings of de Toledo et al. 2012 and their groups that the scapula contributed more to movement of the arm in RSA compared to healthy subjects [28, 32, 45]. From these findings one can conclude that the training of scapulothoracic setting and motion, as well as strengthening of the scapulothoracic muscle, may play an even more important role in the rehabilitation process than in shoulders with an anatomic joint. Deltoid function is essential for shoulder function after RSA. Jobin et al. showed that intraoperative lengthening of the deltoid could achieve an improvement in active forward elevation . How far specific training of the deltoid and especially the anterior segments could be effective has not been investigated as yet. The high load on the deltoid muscle over the years can lead to deltoid fatigue syndrome. A large clinical series by Favard et al. revealed a sudden functional loss at between 9 and 11 years postoperatively. The loss of deltoid function over time could be one explanation. Conversely, intensive deltoid training in the young RSA patient could be seen critically for survivorship . Clinical results and, accordingly, the functional expectations of RSA differ between indications such as CTA, RA, revision arthroplasty and fracture cases. Whereas CTA and fracture sequelae show comparable results, revision arthroplasty reveals a lower American Shoulder and Elbow Surgeons (ASES) and constant score . Rheumatoid arthritis (RA) patients also achieved comparable results to primary CTA cases, but had a higher risk of intraoperative fractures and loosening due to reduced bone quality [26, 54]. The treatment of humeral head fractures also achieved good functional results with a constant score between 60 and 70 points . Directly following surgery, the question arises as to whether and to what extent the shoulder should be immobilized. Here the risk of early joint dislocation and structural ingrowth of the prosthesis components is weighed against re-educating deltoid function and regaining ROM. Biomechanically, it seems to be self-evident to give the prosthesis time for bony ingrowth and, clinically, consolidation of soft tissue should be awaited. There are no studies in the literature dealing with the type of immobilization or the length of immobilization. An abduction pillow was used postoperatively in eight of the 24 papers reviewed. Another 12 studies used what they called a “simple sling”. Four papers did not comment on the type of immobilization. The duration of immobilization is given as 3–6 weeks after surgery; no study described direct postoperative mobilization without wearing any kind of immobilizer. The reviewed studies varied in indication for RSA and in duration of immobilization postoperatively, but not consistently, e. g. longer immobilization for fracture RSA. A total of 21 studies described a protocol with the beginning of active ROM training at between 4 and 6 weeks. Only Werner et al. recommended faster active mobilization as early on as after 2 weeks . The use of CPM is only mentioned in two studies, both conducted in Germany within the German health care system, which supports the use of CPM [30, 42]. Cryotherapy, electrotherapy and exercises in a pool are described methods of postoperative rehabilitation. There are no randomized controlled trials (RCT) on any of these modalities and only two studies mentioned these modalities for the standard rehabilitation protocol. The more recent study published by Sadoghi et al. mentioned the regular use of electrotherapy and cryotherapy . Werner et al. described the use of a water pool after day 2 without any specific risk of failure in a descriptive level 4 case series . Most of the papers support the principle of staged physiotherapy, starting with passive ROM training and pendulum exercises. Overall there are two different approaches: one group starts passive range of motion (PROM) at day 1, the other group starts after 2 weeks. Gerber et al. recommended active ROM directly after 2 weeks, while all other studies explained that active ROM training started after week 6. There are no special recommendations for the duration of physiotherapist-guided training. Table 7 shows a comparison between the literature and expert opinion. They generally agree on a 4- to 6‑week immobilization period in a sling or abduction brace. Passive mobilization also corresponds at a timepoint at around 2 weeks. The timepoint for active exercises appears to be earlier in the expert group (mean 3.8 vs. 5.1 weeks). This might be explained by some early studies in which the postoperative protocol was more restrictive [11, 16]. Do you recommend any kind of orthopaedic brace or sling after RSA, and if so, which one? What is the timeframe a brace/sling should be worn? After RSA, the operated shoulder should be immobilizeda for 2 weeks, i. e. neither treated passively nor actively. I think earlyb passive exercise of the shoulder after RSA is beneficial. Assisted active exercises as part of aquatic therapy (e. g. in a training pool) can improve active mobility after RSA. The use of a CPM device makes sense during the postoperative treatment of RSA. In addition to muscular function, the function of RSA depends on stable bony fixation of the implant. Since early humeral loosening is extremely rare, the focus needs to be placed on the glenoid side [29, 47]. In consideration of glenoid notching for postoperative treatment, extensive painful adduction exercises should be avoided especially in medialized implants. Further recommendations could not be drawn from clinical and biomechanical data. The compression force, i.e. deltoid tension, is one of the main stabilizers of RSA . In addition to intraoperative deltoid tensioning, a postoperative strengthening protocol could improve these forces. The optimal timepoint is discussed controversially between week 6 and 12 (Table 1 and 3). In contrast, there is a risk of acromial/scapular spine fracture. In high grade CTA with severe acetabularization (Hamada IVb) or patients with additional risk factors for acromion fracture (osteoporosis, excessive deltoid tension), delayed initiation of deltoid training might be indicated . In fact, there is no correlation between acromion fracture and postoperative protocol mentioned in the literature. Poor soft tissue status due to revision surgery or infection and an irreparable subscapularis tendon are correlated with a higher instability rate after RSA [13, 17]. Therefore, an extended immobilization period can be considered to risk stiffness and avoid instability in these high-risk patients (Table 4). Additionally in the case of subscapularis refixation, a slower rehabilitation protocol may protect the reconstruction. A body mass index >35 cm/kg2 correlates with increased complication rates intra- and postoperatively. Whereas infection and medical complications are significantly higher, the rate of instability was only slightly increased, meaning that a delayed postoperative program for obese patients is not indicated [2, 19]. Communication between the surgeon and the physiotherapist is essential to ensure appropriate patient rehabilitation following RSA. Besides the above-mentioned topics, individual factors may affect the course of rehabilitation. These can be divided into patient factors (e. g. preoperative shoulder function, previous surgery and indication) and surgical factors (e. g. type of implant, subscapularis refixation, surgical approach and implant fixation). Within the DVSE expert survey, the influence of subscapularis refixation was rated conflictingly (Table 4). While 50% of experts increase the time of immobilization, the other 50% do not vary their rehabilitation protocol. Biologically, the time it takes for tendons to heal should be taken into account, as in rotator cuff repair. The time from the inflammatory phase through the proliferative phase to the maturation and remodelling phase is around 4–6 weeks . As already mentioned, subscapularis refixation exhibits a protective effect on postoperative instability in RSA [9, 13, 17]. However, biomechanical studies revealed that subscapularis repair increases the force required by the deltoid and posterior rotator cuff and also significantly increases the joint reaction force . This effect is explained by the stronger anterior force couple in relation to the mostly affected and weak posterior force couple. These aspects should be taken into consideration especially for strengthening exercises in the late phase in order to achieve sufficient muscle balance. In general, two approaches to RSA are used: the delto-pectoral and the supero-lateral approaches (“Mackenzie”) . In contrast to the atraumatic muscle sparing delto-pectoral approach, the supero-lateral approach uses a delta split. Alteration or insufficiency of the two anterior deltoid segments are described as risks [18, 33]. The loss of these segments correlates with significantly decreased abduction and flexion moments. In individual cases involving anterior deltoid refixation (e. g. revision cases), it is important to protect these deltoid parts during the early rehabilitation phases . Particularly in the case of revision surgery, the individual soft and bony tissue status, as well as the neuromuscular function of the arm, needs to be analyzed in order to create tailored postoperative treatment. The individual rehabilitation concept in revision RSA is supported by the literature reporting a high rate of postoperative complications (loosening, instability) . As the rate of humeral loosening is described as low, clinical studies made no difference in rehabilitation for cemented or uncemented stems [29, 35]. A comparison of rehabilitation protocols for fracture and CTA showed no relevant differences (Table 5). Nevertheless, postoperative treatment in individual primary RSA indications could differ in severe cases where extensive soft tissue trauma after the fracture or significantly reduced bone mineral density or bone stock in RA patients can be mentioned . In conclusion, individual aspects need to be taken into consideration in order to adapt the postoperative protocol. Therefore, it is essential for the surgeon to communicate the individual changes to the patient, the treating physician and the physiotherapist. Written postoperative treatment schedules may improve communication in individual complex cases. As is commonly accepted for rehabilitation following orthopaedic procedures, rehabilitation following RSA should be staged into different phases to allow a continuous progression with adequate protection of the implant and anatomic structures. Four phases based on the phases of soft tissue healing are usually used (Table 8). The progression should not only be time- but also criteria-based. In general, the criteria for progression need to be individually defined. The literature also lacks general and precisely defined criteria. However, the International Classification of Functioning, Disability and Health (ICF) is a good basis for identifying targets. Orientation criteria are assigned to each phase [22, 31]. – Training of everyday movements: eating, combing hair, getting dressed etc. First Phase (week 1–6): The main goals are to protect the implant (and reconstructions) and prevent stiffness. Parallel to this, the ingrowth of the implant and its connection to the bone should be supported. Mainly passive and assistive exercises are conducted during this time. Second Phase (week 6–12): This period focuses on regaining function and returning to ADL. Therefore, more complex exercises related to daily life are performed. In addition, the development of strength is important in this phase. Third Phase (week 12–16): Further strengthening and an increase in daily activities play an important role in this phase. Special emphasis is placed on proprioception and strength endurance. Fourth phase (>16 weeks): This phase includes a return to full daily activities and/or sports. RSA is an established option in shoulder replacement surgery. The postoperative functional gain is significantly faster compared to reconstructive shoulder surgery, but functional improvement can be achieved up to 1 year postoperatively with consequent training . Therefore, the principle components and concepts of rehabilitation are applied in different ways and controversially discussed. The number of publications on the subject is relatively low and these provide limited evidence. Our search, starting in 1989, was unable to find one guideline, systematic review or level I/II study. Therefore, the article is based on clinical studies, biomechanical aspects and an expert survey; however, no clear recommendations can actually be derived. Taking all the results of our survey together, a basic concept that was solid and valid could nevertheless be created, and which was summarized in a four-phase-model. The main aspects of this model were supported and supplemented for the first time through collected and pooled expert opinions from the DVSE expert society. We cordially thank the following members of the “Rehabilitation” committee of the German Society of Shoulder and Elbow Surgery e. V. (DVSE) for their support and input: Active members: Frieder Mauch (Chairman), Christian Jung (Vice Chairman), Stefan Buchmann, Christian Schoch, Casper Grim, Knut Beitzel, Florian Pfalzer, Thomas Tischer, Michael Krifter, Florian Haasters, Wolfgang Pötzl. Guest members: Lena Tepohl, Reina Tholen, Thilo Kromer, Ferdinand Bergamo, Thomas Gottfried, Tobias Baierle, Hans Ortmann, Manuel Klose, Bettina Mauch. S. Buchmann, C. Schoch, C. Grim, C. Jung, K. Beitzel, M. Klose, B. Mauch, F. Pfalzer, L. Tepohl, R. Tholen, T. Gottfried, H. Ortmann, M. Scheibel and F. Mauch declare that they have no competing interests.